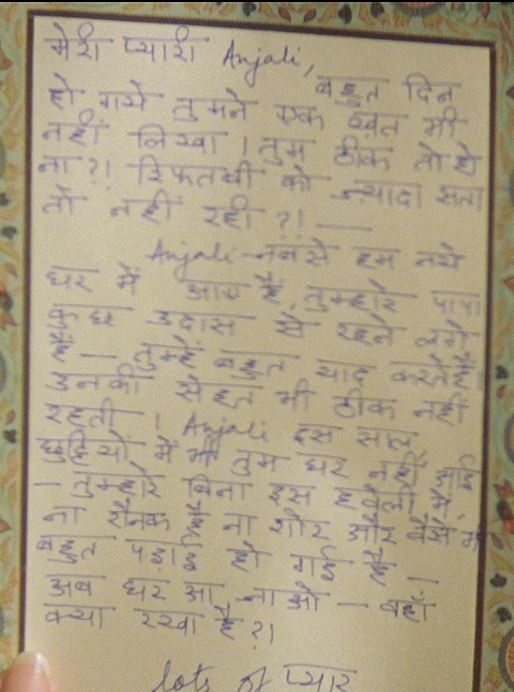 I rewatched Kuch Kuch Hota Hai, and decided to try to translate the letter Anjali is reading at about 1:23:36. Now, this is what I read, followed by what I translated. I put in bold words I am not sure of. tum thiik to ho naa ? rifat bhi ko zyaadaa sataa to nahin rahii ? vahaan kya rakhaa hai ? I's been many a days since you haven't written a single letter. Are you fine or not? Does Rifat Bi feel better or not? Anjali since we are in our new home, your dady has become very sad. Now when do you come home? I think I succeeded for most of the lines, but I surely mistook here and there. It would be nice of you if you could correct my mistakes. reply at bottom, but expect very little help from it. D.
I would help if I could, but I don't read Devinagari script, and I know few Hindi words. That only leaves a few quibbles about the English, which you are very good at. ... "I's been" = It's been" (for "It has been") but I bet you dropped that "t" by accident. ... Rifat Bi (from "bhi") - perhaps it was "bhai" = Rifat brother. ... "Daddy" is spelled with a double "d" making three in all, and the first, referring to a particular person, is capitalized. ... "is'nt" contracts "is not" with ' replacing the deleted letter, so "isn't" but again I guess it was just a typo. Hindi to English has many problems of idiom. Hindi to French may be easier, and then French to English is full of tripwires. I always comprehend your translations, which is the only important thing. Howard "Dancelover" Wilkins, hoping that someone else is more helpful to you. reply at bottom, but expect very little help from it. D. Hello Howard, every help is precious! That only leaves a few quibbles about the English, which you are very good at. Touché! ... Rifat Bi (from "bhi") - perhaps it was "bhai" = Rifat brother. Rifat Bi is a supervisor who helps girls in the university's dormitory. ... "is'nt" contracts "is not" with ' replacing the deleted letter, so "isn't" but again I guess it was just a typo. Right again! Hindi to English has many problems of idiom. Hindi to French may be easier, and then French to English is full of tripwires. Well, French grammar is very difficult, I prefer English one. But indeed you're right, French-English and vice versa are full of traps. (Thanks for "tripwires", I didn't know that word). German grammar is more similar to Hindi one, with the verb always at the end of the sentence.